Put in hamburger and onion. Fry uncovered until hamburger is well browned, stirring often. Stir in tomatoes, water, and pasta. 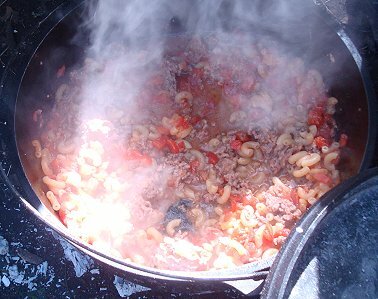 Reduce heat to about 225 degrees, cover, and Simmer for 20 minutes or until pasta is tender. Sprinkle cheese on each bowl when it is served. Let me know how you enjoyed your Chili Mac!